Do like movies whose main character is the bad guy? Movies don’t always follow the exploits of the gleaming goody two-shoes. Sometimes, it’s fun to watch stories about bad guys. There are lots of upcoming superhero movies that are doing just that, Venom, The Sinister Six, and now the Suicide Squad. But this idea does not live exclusively in the realm of comic book superheroes. 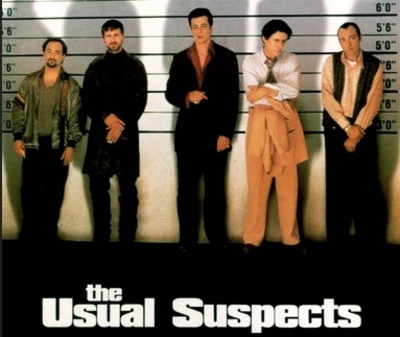 Movies like The Usual Suspects and The Godfather are amazing stories where the protagonists are serious bad guys. Do you like movies that focus on society’s underbelly? Which bad guy do you love best? I'm not keen on these, generally because they tend to be gangster films. I do like the idea of the bad guy as protagonist though. I'm with you about Gangster films, they never really did t for me, but I loved the Usual Suspects and Until Dusk form Dawn which both featured groups of bad guys. Yes, I find this a refreshing change from the main guy always being the "good guy"
Yes, definitely. Sometimes the 'baddies' are more interesting! I love these kinds of movies although, with a few exceptions, like The Godfather. I just don't dig gangster movies. The 'baddies' make the most interesting lead characters! Just look at Shakespeare's Tragedies! On stage, too. Javert was the best part in 'Les Miz'. The Phantom was the best part in that stage show. Just think back to movies of the '30's-'50's, & all the 'bad guys' then. of Evil' (1958), in which he played the vile looking, corrupt cop. He also directed that film. It's now considered one of the classic 'noir' films. It had Charlton Heston playing a Mexican policeman, no less! He was in this before 'The Big Country', which gave William Wyler the idea of casting him in 'Ben-Hur', as Messala. The actors' he'd requested to portray 'Judah Ben-Hur', either declined the role, or failed the screen test. So he gave the role to Charlton Heston, & as is said, the rest is history! Which movie actor would you like to see make a comeback? Does a movie’s rating affect your desire to watch or not a watch that film? What is the Best Comic Book Series? What is your go-to genre when searching for new shows?